The survey polled 1,007 Americans at the end of December 2017. CHICAGO (January 30, 2018)—Almost exactly a year after Donald Trump assumed the U.S. presidency, Americans’ trust in the country’s main financial institutions is climbing steadily, with faith in the stock market at its highest level since the survey was launched in December 2008. 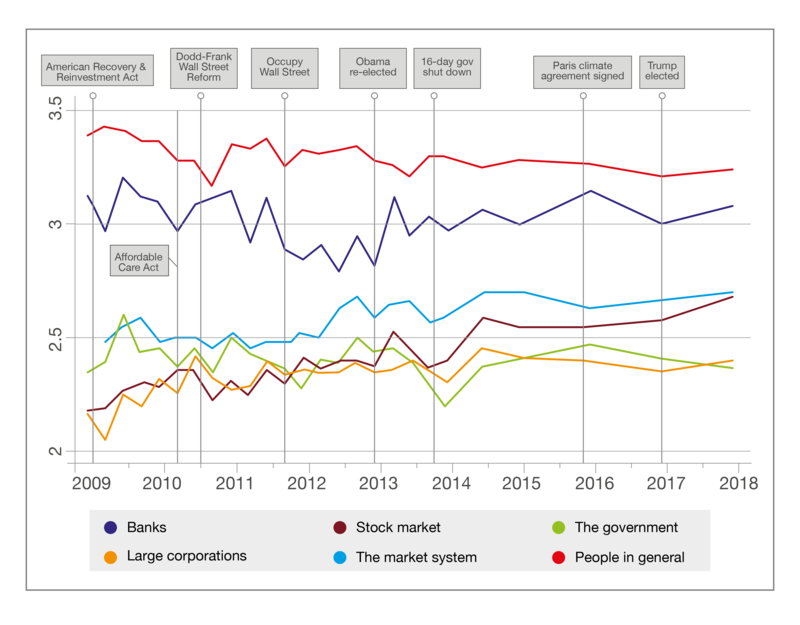 The most recent Financial Trust Index (FTI) survey, an initiative of the University of Chicago Booth School of Business and Northwestern University’s Kellogg School of Management, shows that average trust in large corporations, now at 2.4 on a 5-point scale (with 5 being trusting completely and 1 not at all), is approaching its 2014 peak of 2.46, and faith in the market system, at 2.71, is also at its highest level since 2008. Only 31 percent of respondents now say they are angry about the economic situation. This is the lowest level since the beginning of the FTI, compared to its peak at 63 percent in March 2009 following the passage of the American Recovery and Reinvestment Act, a fiscal stimulus package aimed at ending the Great Recession. But faith in the government (at 2.37 on the 5-point scale) is wobbling, currently hovering at its lowest level since the 16-day government shutdown late in 2013. The results contradict a longstanding stereotype of an American population hostile to banks, with the reported level of trust in banks (3.1 on the scale) second only to trust in other people in general (3.2 points). Trust in the other institutions included in the poll (the Federal Reserve, stock market, mutual funds, brokers, bankers, large corporations, insurance companies, the market system, and the government) fell below 3 points. Trust in several key market institutions is significantly higher among Republicans, who express on average 0.49 points more trust than Democrats in large corporations, 0.34 points more trust in bankers, and 0.26 points more trust in the market system overall. But they express significantly less faith (0.32 points) than Democrats in the Federal Reserve. Responses from participants with annual incomes over $100,000 or at least a 4-year college degree largely tracked those of Republicans. On average they express greater trust than their counterparts in the market system (0.45 and 0.4 points higher, respectively), mutual funds (0.58 points and 0.39 points), brokers (0.26 and 0.28 points), and the stock market (0.1 and 0.27 points). Unlike Republicans, however, both of these categories have higher trust in the Federal Reserve, with those who earn above $100,000 reporting trust levels 0.38 points higher, and those with at least a 4-year degree reporting trust levels 0.45 points higher, than that of their respective counterparts. Men also report higher levels of trust in market institutions, expressing 0.32 points more faith than women in the market system, 0.26 points more faith in the stock market, and 0.23 points more faith in large corporations. In two seasonal supplements, respondents also answered items on Bitcoin and their preferred news providers. Sixty-five percent reported having heard of Bitcoin, although only 61 participants out of 1,007 indicated they own or plan to buy Bitcoin within the next six months. More than three-quarters of those 61 respondents were men. With regards to where they obtain their news, 45 percent of all respondents reported getting news from television, 9 percent from the newspaper, 27 percent from offline sources, 11 percent from the radio, and a surprisingly low 5 percent from Facebook. ABOUT THE SURVEY: On an annual basis, the Financial Trust Index captures the amount of trust that Americans have in the institutions in which they can invest their money. The study was conducted for the Financial Trust Index via telephone by SSRS, an independent research company. Interviews were conducted from December 27, 2016 to January 3, 2017 among financial decision makers. A total of 1,011 interviews were conducted, with a margin of error for total respondents of +/-3.69 % at the 95% confidence level. More information about SSRS can be obtained by visiting www.ssrs.com. 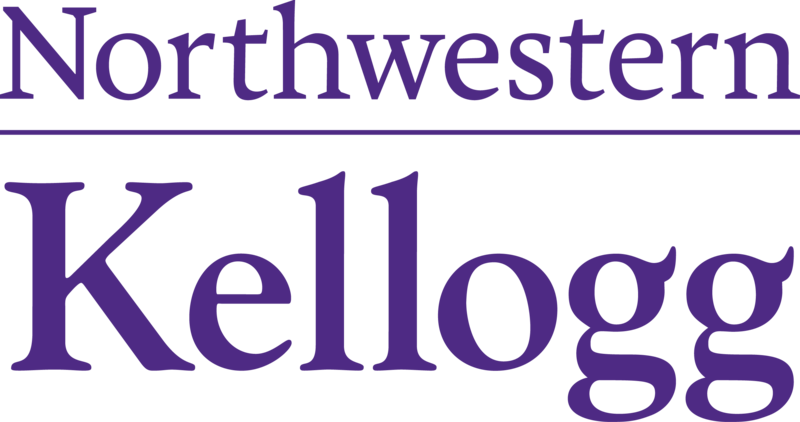 1 Paola Sapienza is the Donald C. Clark/HSBC Chair in Consumer Finance Professor at the Kellogg School of Management at Northwestern University. Luigi Zingales is the Robert R. McCormack Distinguished Service Professor of Entrepreneurship and Finance at the University of Chicago Booth School of Business.